The Dow Jones experienced a 2nd day selldown as a positive ADP report failed to stem concern about a pathetic Spain’s bond sale, a weaker-than-expected ISM servicing index and diminishing hopes of QE3. The Dow Jones plunged as much as 179 points before narrowing the losses to 125 points at 13075 as the market is looking for an excuse to pause and digest the strong rally in 1Q12. After surging to 52-week high at 13297 on 2 April 12 from 52-wk low of 10404 on 4 October 11, the Dow Jones began its long overdue pullback to close at 13075 yesterday. 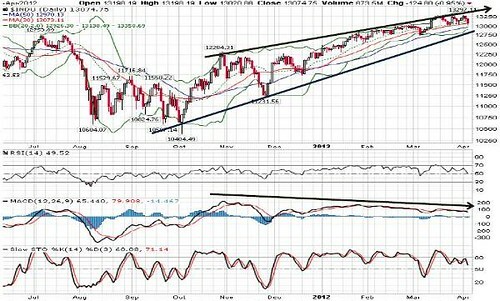 Technical indicators are showing divergence signals, with a possibility that an uptrend could end and a reversal pattern is in the pipeline. If prices fail to push above the wedge resistance over the next few days, selling pressure could accelerate and take prices lower. As the 30-d SMA support was violated, the Dow Jones could head lower towards 12970 (50-d SMA) and 12926 (lower Bollinger band) before technical rebound emerge. Current rally will be disrupted if the uptrend line support from October 11 near 12800 is broken. Resistance levels are situated at 13297 to 13350 (upper Bollinger band).